Bangladesh face a tough battle to save the series-deciding second and final Test against the West Indies despite opener Tamim Iqbal’s bold 82 not out on Tuesday. The hosts, chasing an improbable target of 508, were 164-3 in their second innings at stumps on the penultimate day of the match in Dhaka. 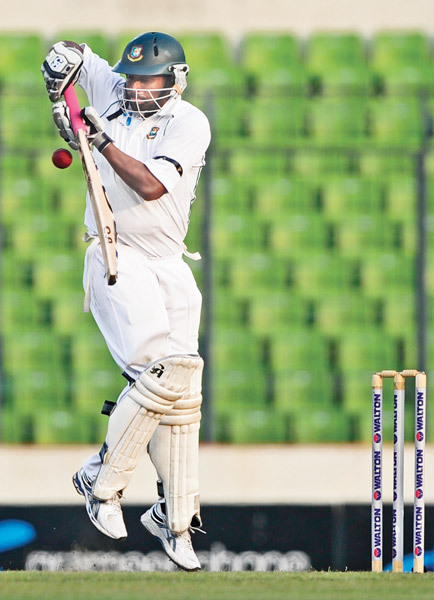 Skipper Mushfiqur Rahim was unbeaten on 33. The ‘walk to swim’ organized by Isipatana College Old boys Association was successfully held earlier this week. The event had been organized to raise funds for the construction of a new swimming pool at Isipatana College. Eight years old Abdullah Manzil of Trinity College Kandy won the boys under-10 title at the All Island Intermediate and Novices Table Tennis Championships held at the S. Thomas’ College gymnasium recently.